Roadmaster announces partnership with REZET for Eurotour 2012! It is with great pleasure and satisfaction that Roadmaster Booking announces his new partnership. This time with the young German thrashers REZET. 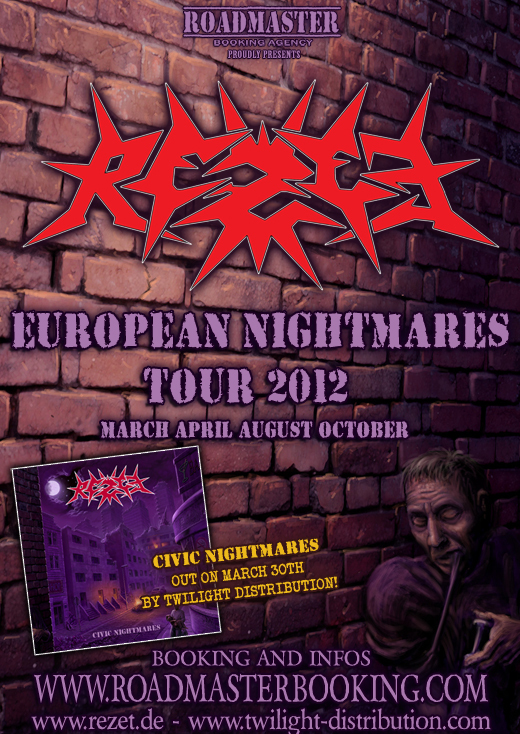 Entitled “Nightmares European Tour 2012”, the tour will take place in March, April, August and October. REZET will be promoting the second studio album, “Civic Nightmares”, that will be released on March 30th by the German label Twilight Distribution. Roadmaster anuncia parceria com VIOLATOR para Eurotour 2012! Roadmaster anuncia parceria com REZET para Eurotour 2012!